Parents with very small children are welcome to relax in the back room and listen to the service on the speaker there. There are worksheets available in Clare’s corner for older children. A special welcome to visitors. Please join us for refreshments after the service. Today	10.30am Easter Sunday Service led by Terry followed by refreshments. (No Evening Service) 4.00pm Woodbridge Baptist Church is holding a Baptismal Service in the sea near the Brudenell. Tuesday 10 – 11.30am Rainbow Tots at the Community Centre. 11.30am Holiday @ Home planning meeting. Wednesday 7.30pm “Freedom in Christ” course with coffee and cakes. 7.00pm Filling Station at the Riverside. Friday 10.30am – 12.00 “Friendship Friday” at the Library. Sunday 28th April 10.30am Morning Service led by Terry followed by refreshments. Start of Term Term restarts after the Bank Holiday. Our regular activities start up again this week. Coming Soon 29th April Monday 7.00pm Church Meeting. Parish Nurse Ali will be back in action this week. You can contact her on 07870 946475. From Monday May 13th Ali and Gill will be taking over the monthly club at the Fairfield 11.00am – 2.00pm on the second Monday of the month. Pray for Ali and Gill as they take over this new venture. Peace on our streets Please continue to pray about the significant increase in crime – including knife crime – being committed on our streets - go online and see the map (www.peaceonourstreets.org.uk). Today's Decorations Thank you to all who worked so hard to produce such a beautiful display for Easter. Just Arrived Latest magazines & information from Scripture Union & Anchored. Collect copies from Clare's Corner. Mozambique and Cyclone Idai There are still many communities which have not yet been reached by the rescue and relief services. Give thanks that a large scale vaccination programme is limiting the spread of cholera. Prayer: Here are some of the things our fellowship will be praying about this week. 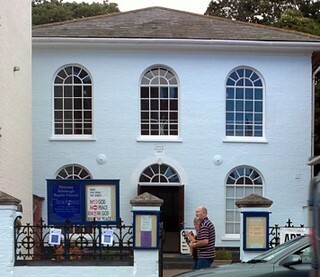 EBA: Saffron Walden Baptist Church has been prominently placed on the High Street of this small market town in rural north Essex since 1774. It is a hub for community engagement, with several organisations using it throughout the week covering a range of needs from mental health and counselling to pilates and a day nursery. The congregation is experiencing a renewed confidence in Christ and learning how to fulfil their calling to be a welcoming and all-embracing community. Adopt-a-Road: We are praying for the residents of Fairfield Road this week. Dec 11th (Tues)	10.00	Christmas Story at Rainbow Tots.